This sweet fresh dress features the delicate tiny floral embroidery to fill up the surface of lace, high waistline and V-shaped cut at the back with concealed zipper. The lightsome lace overlays the light blue lining with the sweetheart neckline design. Pair it with your elegant high heels to shine out among the people. 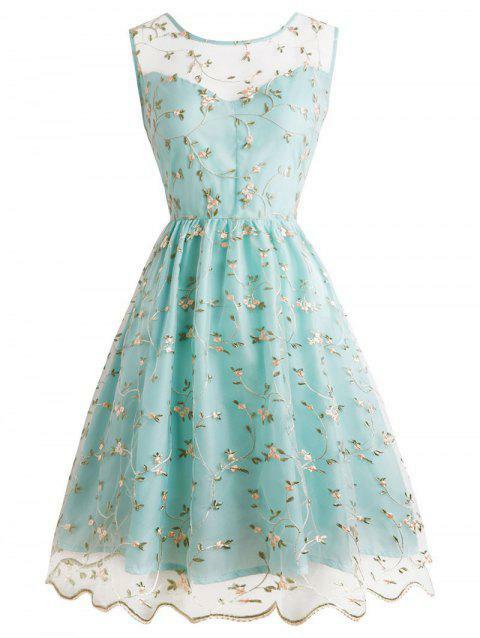 This is such a delicate dress. It is gorgeous. I like the way the color subtly shows through the overlay. It is an amazing color too. It's so delicate, beautifully made, color is amazing (mint)! I'm going to wear it on my best friend's wedding! Size seems appropriate. I highly recommend that dress! Q:What size would u perfer for a 12 year old? Q:Do you have waist and shoulder measurements for this dress? The size guide only shows length. The shoulder is 39cm and the waist is 72cm. Q:Hello. We are a team of 9 women and I would like to know if there are available sizes for this dress and how long it will take to be sent in Greece? The items are in stock in any sizes.